The Dow Jones Industrial Average on Wednesday rose 117.51 points, or 0.46 per cent, to 25,543.27. 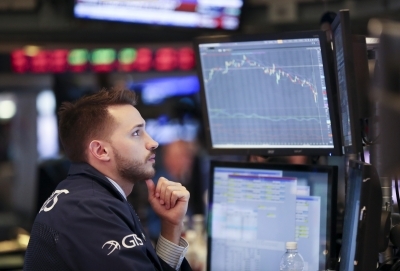 The S&P 500 was up 8.30 points, or 0.30 per cent, to 2,753.03, Xinhua news agency reported. The Nasdaq Composite Index rose 5.76 points, or 0.08 per cent, to 7,420.38. Shares of Diebold Nixdorf surged more than 39 per cent around market close, after the US ATM manufacturer reported quarterly revenue that topped analysts' expectations. Its guidance for 2019 also appeared to be strong. Shares of Hilton Worldwide also sharply rallied nearly 6.8 per cent around the closing bell, as the US hotel chain reported quarterly profit that beat Wall Street forecasts. Nine of the 11 primary S&P 500 sectors extended gains on Wednesday, with the energy sector up nearly 1.3 per cent, leading the gainers. More than two thirds, or 71.5 per cent, of the S&P 500 companies have posted stronger-than-expected quarterly earnings as the fourth-quarter earnings season is approaching to an end. The market was also encouraged by continued optimism about the prospect of trade progress to be made between China and the US, as investors kept a close eye on the latest updates regarding their trade talks. On the economic front, US Consumer Price Index (CPI) remained unchanged last month, as falling gasoline prices eroded increases in the cost of food and rents, the US Bureau of Labor Statistics reported on Wednesday. The CPI increased 1.6 per cent for the 12 months ending January, the smallest increase since the period ending June 2017. Investors widely believed that the data, indicating upbeat inflation level, would help the US Federal Reserve keep its interest rates steady for some time, as the Fed not rising rates is normally favourable to the stock market.